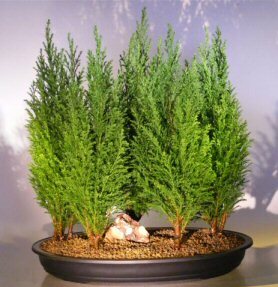 The Italian Cypress or Mediterranean Cypress is a great indoor bonsai tree which can be grown singularly or in groups. Originally found in the eastern Mediterranean area, this bonsai is susceptible to the cold which means that either you must bring it indoors during the winter or grow it in a fairly warm climate. These bonsai look amazing when grown in small forest groups. They feature fine green/gray foliage which actually grows in flattened sprays. They also grow "cool looking" tiny elongated brown cones during the year, something that is somewhat rare in bonsai. Easy indoor maintenance. Suitable humidity/drip tray is recommended. To purchase add $18.95.